Use fr34k's automated NVIDIA & AMD eGPU macOS 10.13 installation script to skip instructions below. Otherwise: Thunderbolt 1/2 users on 10.13.4+ require a TB1/2 eGPU support enabler. 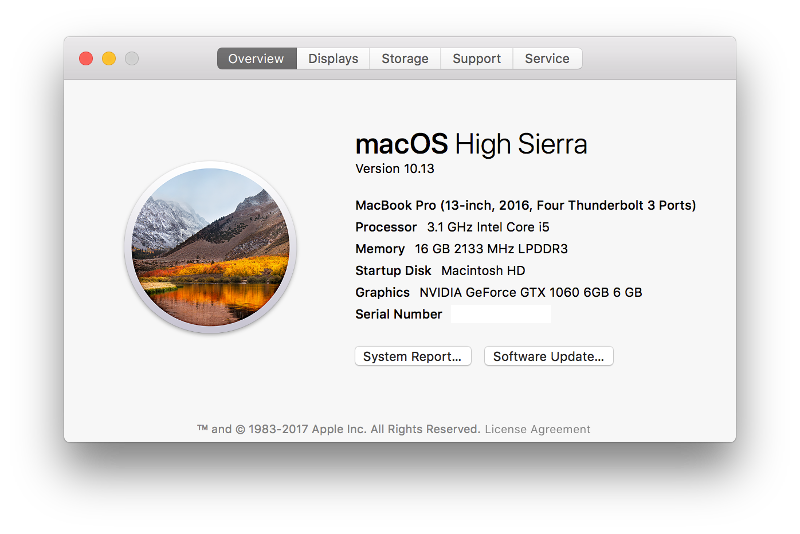 Note: macOS 10.13.4 has native TB3 AMD card support . No need for workarounds likes presented below for Nvidia cards. Source: NVIDIAEGPUSupport (source fork). Note: yifanlu's installer package is no longer hosted on GitHub as of Oct-31-2017. Remove/undo any Info.plist modifications (they aren't needed anymore and might conflict). Install the package linked above! Q: I am having problems with the new Nvidia drivers on 10.13.3. What to do? Q: How do I uninstall the script? Just delete /Library/Extensions/NVDAEGPUSupport.kext. No other files are created/modified by the installer. If it still does not work, please report: symptoms, model of your mac, model of your egpu box, model of your graphics card, model of your display(s), and the kind of cable you used. I'll try to keep a list here to triage the problem. 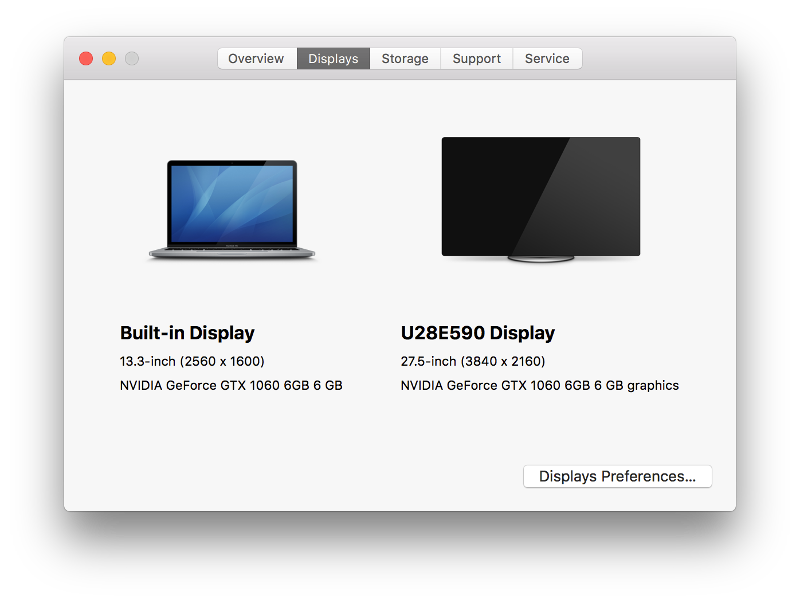 External display connected to eGPU does not show an image (black screen) but OSX thinks a display is active and connected. Might see cursor on the black external screen. Might show "fuzzy" desktop image on the internal display. Hi, I registered on this forum just to say that you are AWESOME! Is NVIDIA already detected as CUDA device with your fix? @yifanlu: Good job. Is the attached-gpu-control-path now visible under ioreg display properties and "AGPM::start" & "gpuDict by GPU display" lines appear in the system log? If you can, try to run Apple's new AGDCDiagnose that prints all active GPUs, accelerators and FBs. I've also seen that the tree in IORegistryExplorer (as well as the key-values) match what's constructed in Sierra (with the exception that my NVDAPatched classes are used). It also says NVIDIA GeForce 1060 6GB in system profiler. I think the drivers are loaded correctly, it's just a matter of getting them to work correctly. Not hot-pluggable. The way it used to work with automate-eGPU.sh and Rastafabi's eGPU enabler. No but even the Sonnet box + AMD card doesn't support hot plugging. You just get a notification telling you to log out or if there's multiple users connected, to restart. Getting that message to show up won't be too difficult, but that's not my focus right now. Marvellous, I can upgrade now. CUDA was the only thing I actually needed, and all this with some lines of code. Btw, @goalque, what is needed to implement hotplug without crashing on this solution? Wait really? My 2016 13" MBP doesn't work. But I didn't run automate-eGPU.sh or Rastafabi’s eGPU enabler. Are you telling me that it will work after running that? No changes needed? Well as per yifanlu first post I thought it was not possible to get pass via login screen ... but as per your screens it looks like it was fixed ? Is this already a thing? I don't need eGPU acceleration, I just need the monitor to display the image thru the eGPU. Is it already possible? I didn't do any extra steps. Just the NVIDIAEGPUSupport.kext in /Library/Extensions and rebuilt cache (a snippet from automate-eGPU.sh). What's your eGPU hardware? So to get this straight, you only need to do yifanlu's step and this? "rebuilt cache (a snippet from automate-eGPU.sh)"
What's a snippet from automate-eGPU, is it a part of the script? I have a 1070 gaming box, if I do yifanlu's step from github, do I also need some part of automate-eGPU to get this to work? I have a 2016 MBP with touchbar running 1060 6GB on an HP OMEN Accelerator. It might also be because I've mucked around with the OS so much in testing and debugging the problem. I'll do a clean install when I get home and report back. I've updated the code to support Tesla devices as well. Also I've posted a prebuild kext in the releases section. Just had to pop in and say thanks! Compiled your driver, rebooted, and Boom. It just worked. My Macbook Air (13-inch, 2017) with my homebrewed dock(Echo ExpressCard PRO to GDC Beast) With a GTX750ti just worked. Right out of the gate! This escalated quick! Any chances NVIDIAEGPUSupport.kext works better with older Nvidia GPUs than 10-series? I am not absolutely sure if there are other changes... I will confirm with a clean macOS 10.13 installation on the Late 2013 13" MBP. If you look at the code, it's pretty simple. I'm just telling IOAccelerator to ignore the fact that we're a tunneled device to bypass this check added in High Sierra. In theory it would make it the same behavior as in Sierra. The other thing it does is add the IOPCITunnelCompatible flag to its own Info.plist so you are not required to modify any other kext. I don't think it would make any hardware run better. Thank you for explaining the inner workings of NVIDIAEGPUSupport.kext. You won EPIC 1st post on eGPU.io forum. Any clue why Apple is replacing IOFramebuffer with ATIFramebuffer? For plug-and-play? As if this was left for us... 😉 no real reason to use PlistBuddy 🙂 It led me to create automate-eGPU.kext for older AMDs. Hopefully they continue supporting 'ndrv' drivers. There is no ATIFramebuffer class. What's changed is the IOMatchCategory which after hours of searching I still have no firm grasp of what it's used for. I've fully reversed ATIGpuWrangler when I thought that was the main culprit (spoiler: it's useless) and how it works is that in AMD-land, ATIGpuWrangler is the first match driver and it sets up the other drivers as well as the ports. However in NVIDIA-land, NVDAStartup(Web) does a similar task--but not in the same way which is why that IOFramebuffer::attach function fails. It's a bit complicated and I might write a longer post in the future, but the upshot is that the AMD driver setup process is slightly different and I believe at some point it used IOMatchCategory to "find" the other parts of the drivers. But in the end they decided to introduce new keys like "LoadController" instead. I recently committed some changes that are completely untested. If you build the commit from yesterday, it might work better. Interesting keywords and binary matches. AMDSupport especially. Something is in there. We are, of course, curious. We don't reverse engineer. For those of you who have it working (me not included 🙁 ), can you test if https://github.com/mologie/NVWebDriverLibValFix is needed? ... issue with transparent windows without content, which appear for applications that use Metal and have Library Validation enabled. I want to know if I need to bundle NVWebDriverLibValFix.kext as well because I'm pretty sure egpu users will suffer from the metal+library validation problems as well. What? So, can I make Aorus Gaming Box work on High Sierra? Aorus Gaming Box is my favorite because it's the most compact one and also provides 100w over the cable. Will I be able to use power delivery and usb hub on the chasis? edit: I don't know how to thank you if it works. Please be aware that during NVIDIA drivers install SIP needs to be enabled, otherwise you will get the errors and it won't work properly. A clean macOS 10.13 reinstallation (17A405) done. 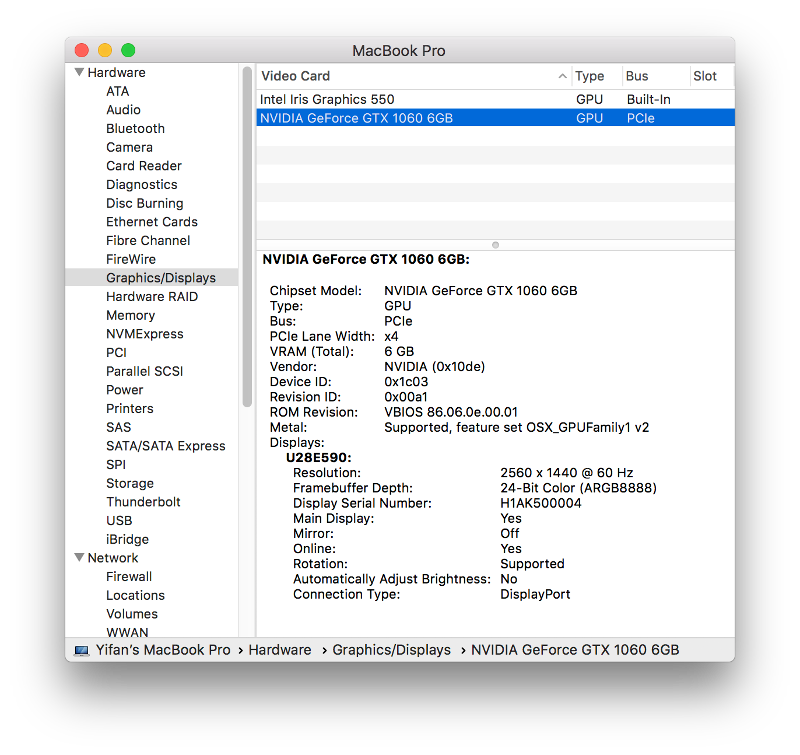 Late 2013 13" MBP + reference GTX 980 works great via Apple's TB2-to-TB3 adapter. Bundle version 1.